We have just added this wine on by the glass at Max Downtown. The Jeune family is one of the most highly regarded Rhone producers and we are very excited to be featuring this wine. We will have it available through the Spring, while supplies last. This wine is fermented and aged in cement vats and is composed almost exclusively of the Counoise grape variety, one of the thirteen varieties permitted to be used in making Chateauneuf-du-Pape. Supplemented by just a touch of Alicante, this wine is usually bottled 18 to 20 months after harvest and offers a full-throated roar of the garrigue that so defines the wines of this region: the wild herbs and slightly animal notes that make this modest wine so full of character. A majority of this wine is destined for the US market (24,000 bottles). 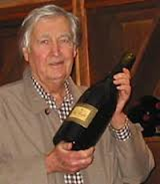 The Domaine de Monpertuis has been in the hands of the Jeune family for six generations. In fact, the records of the village of Chateauneuf-du-Pape show that Pierre-Paul Jeune, a local vineyard owner, was born in Chateauneuf in 1775. Each successor in the Jeune family added bits and pieces of vineyards to the expanding whole of the estate so that the current owner, Paul Jeune, now farms a total of thirty hectares, some owned as proprietaire and a portion worked under the share-cropping system of metayage and fermage. The holdings are scattered amongst 48 separate parcels throughout the boundaries of Chateauneuf du Pape and extending on the western side of the Rhone River. The wide variety of soil types and exposures amongst the parcels in Chateauneuf give Monpertuis the resources to craft a classic version of Chateauneuf-du-Pape in both red and white. Jeune has the remarkable good fortune of having a majority of his vineyards planted to vines between 60 and 130 years of age. The remaining vineyards generally are between 25 and 60 years, except for some new plantings of white varieties like Roussanne. The multiplicity of parcels spread across Chateauneuf imparts a classic character to the wines of Monpertuis, absorbing the nuances of each soil type of the appellation. However, the heart and soul of the domaine lies within three primary parcels, all within the village confines of Chateuneuf: La Croze, Le Clos de la Cerise, and Monpertuis. 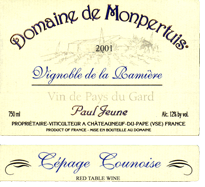 Although Chateauneuf-du-Pape may be composed of 13 individual varietals, the Domaine de Monpertuis relies most heavily on the Grenache grape and the vineyards are heavily planted to this noble variety. The vineyards are worked according to the principles of organic viticulture. On the western side of the Rhone, in the Gard district, Jeune works the “Vignobles de la Ramiere” from which vineyards he produces two wines: a Vin du Pays du Gard “Counoise” and a Cotes du Rhone. This site is near Monfaucon which is not far from the Tavel and Lirac appellations. These vineyards, as well, are farmed organically. All vineyards are hand harvested. The white varieties are picked early to preserve acidity and aromatic intensity and are fermented separately according to grape variety under controlled temperatures. For the red wines destined for the US market, the grapes are either not destemmed at all or are only partially destemmed. This is an ancient practice. 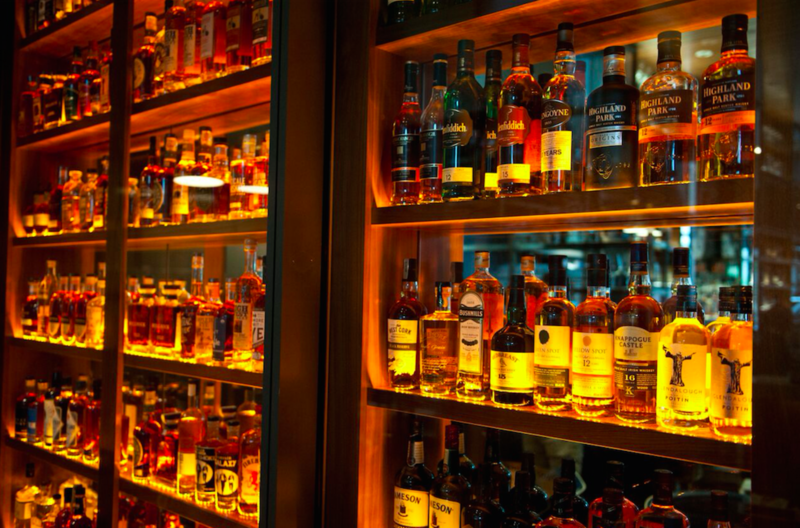 This week at Max Downtown, two new Whisk(e)y were added to the library offering of specialty spirits. I say Whisk(e)y with the (e) because one of these products comes from the USA – High West Distillery from Park City, Utah, and the other comes from Scotland – the Glenmorangie Distillery in Tain, Ross-shire, Scotland. The practice for spelling whiskey without an “e” is common in Scotland and some of the Commonwealth regions, so we must adhere to this. It just helps to tell them apart a bit easier. The first product from High West is the fourth whiskey we have from this unique and quite frankly compelling producer in Utah. This product is the American Prairie Reserve Whiskey, which is a blend of two whiskies; the first of which is aged about six years and is composed of about 75% corn, 20% rye and 5% malted barley, while the other portion is from ten year old whiskey, which is composed of 60% corn, 35% rye and 5% malted barley. You will not see an age statement on the label of this whiskey, as it is illegal to do so when there are blended ages such as this, but you will find a truly balanced and deeply flavored whisky that hits the palate with rich flavors of sweet oak and grains, with a smoky and soft finish. Really one of the finest that we have tasted from this distillery to date. Available for a limited time. basically while supplies last, which is usually not very long as aged whiskies are becoming more and more of a challenge to acquire. 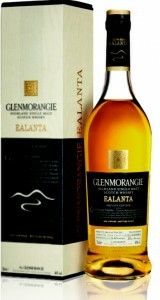 The second whisky that was acquired by Max Downtown this week is the Glenmorangie Ealanta. This Scotch is a beautiful whisky that is part of a very limited production range called the Private Edition. It isa 19 year aged whiskey that has spent its time in virginAmerican oak casks sourced primarily from Missouri. The affect of this style with so much age is an ultra-smooth, richly flavored whisky with deep flavors of orange peel, brown sugar and roasted almonds. The expression is almost unique in the world of Scotch, or whiskies in general. Extremely limited production, this whisky will go quickly and be gone forever. Last night at Max Amore Ristorante in Glastonbury, over 30 guests were treated to a fabulous dinner and the wines of two of Italy’s favorite winemakers. 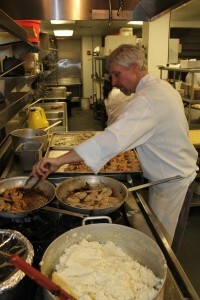 Chef Ted Burnett was on his game with a menu that touched on both traditional Italian cuisine as well as influences with a modern twist (see the menu below). 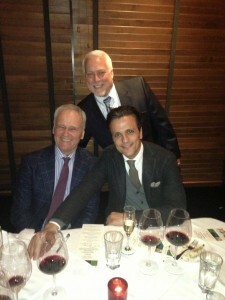 Guests were also treated to wine coming from both the north of Italy as well as the far south. Starting and finishing with the Prosecco from Primo Franco, a third generation winemaker from the heart of the Prosecco region and his family estate called Nino Franco Winery. Delicious wines that, as Primo pointed out, “are a way of life and can be great anytime of the day or night as they are light and refreshing”. In between guests were treated to the deliciously fruit driven wines of Diego Cusumano from Sicily. From the youthful and value priced Nero d’Avola (a wine featured on the Max Amore wine list) to the fabulous blend of Nero d’Avola and Syrah called Benuara, to the final wine, a 100% Nero d’Avola called Segana, which is sourced from the best vineyards at Cusumano Winery, these wines were as good as it gets. Next up at Max Amore, Chef Burnett teams up with Max Restaurant Group Beverage Director Brian Mitchell to present a Max Wine & Food School Seminar, theme: Regional Italian Wines and Cheeses. Feb 11th. See the Max Restaurant Group website Calendar for full details. Most people will remember Fess Parker for his acting roles as Daniel Boone and Davy Crockett in the 1950s and 60s. He passed away in 2010, but did you know that he and now his family have owned a 715 acres winery and vineyard estate in Santa Barbara for the past 30 years? That his wines have won countless awards? And that this region grows some of the best Pinot Noir in the country? The Max Restaurant Group is very pleased to announce that we will be offering the newest wine from the Fess Parker Winery; the Fess Parker Pinot Noir Sta. Rita Hills, 2010. In fact Max Group will be the very first location in the country to offer this wine for sale. We have made special arrangements to list this wine directly from the winery before it becomes available for wider distribution later next year. As part of this promotion, the $18 glass price will be available for $13 and the customary $66 bottle price will be reduced to $48. Supplies at these prices are limited and will only last through February. Stop into any Max location to try this fabulous wine from a great wine region. First created in 2001, the Sta. 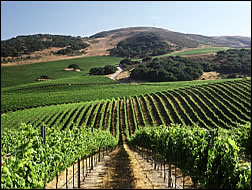 Rita Hills viticultural appellation is uniquely situated to receive maritime influences that create the ideal climate for growing exceptional wine- grapes. Inspired by the incredible potential offered within this wine region, a diverse group of talented growers and winemakers are producing some of California’s most exciting Pinot Noirs, Chardonnays and other varietals. As with any new region, the winegrowers and winemakers have developed a camaraderie stemming from their love of this region and the excitement of the achievements made thus far. Sta. 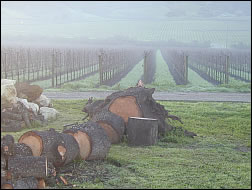 Rita Hills is a relatively small appellation of approximately 100 square miles. Intersected by the Santa Ynez River, the cool climate appellation is located between the towns of Buellton and Lompoc in Santa Barbara County, California. Cool weather, fog, wind and the soils limit vine vigor, crop yield and intensify the flavors of the wines. Distinct geology and geography combine to form an absolutely unique maritime corridor. Two east-west oriented valleys represent some of the most incredible dirt and unique climatic influence in the Pinot Noir world. Other great growers and producers from this fabulous region include: Brewer-Clifton, Clos Pepe, Foley Estates, Foxen, Pali, Sea Smoke, Siduri, Sanford, and many others. Since opening, our Max Burger locations (either in West Hartford Center or Longmeadow) have dedicated a tremendous amount of thought to beer. Finding and selecting just the right brew to run. Making sure the styles do not get too similar, or that we keep the fan favorites around. One thing that this attention to detail has given us is the ability and desire to find the unique, local brews. 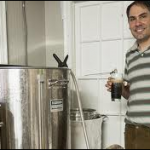 In West Hartford we have developed a relationship with Mark Sigman, owner of Relic Brewing in Southington, Ct. Mark is a craft brewer in every sense of the word, essentially brewing small batches out of his garage to get started. To date, Mark and Max Burger have joined forces regularly to bring Central Connecticut some of the unique and finely crafted brews that are the hall-mark of Relic Brewing. 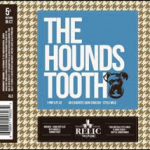 The latest addition to the line-up is the Hounds Tooth Dark Mild English Ale. An old school English style which is traditionally malty and dark but lower in alcohol. This one is 5%abv, which is on the higher end for the style. Its brewed with traditional English malts, hops and yeasts including various types of chocolate malts, and dark crystal which combine to give some burnt raisin, caramel and hints of roasty chocolate. Some fuggles hops lend some spicy earthiness. Delicious, smooth but still a unique small batch brew, this is perfect for cold weather sipping. Limited time only. 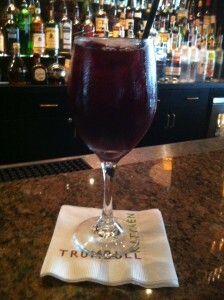 This afternoon, I made a batch of Sangria at Trumbull Kitchen and loaded it up online so that it now pours fresh from a draft line. 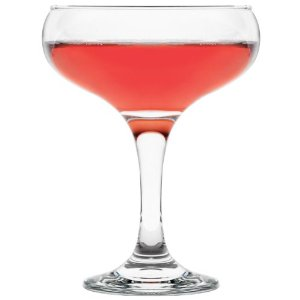 The advantage is that I can make it in larger batches for better consistency from glass to glass, it stays fresh under a blanket of gas, which also helps to give it a bit of carbonation, and we can get it to your table quick and easy. Great summer cocktail, my Sangria is a blend of Red Wine, Spanish Brandy, some fresh fruit juices, Agave nectar and Orange Liqueur. Give us some feedback when you taste it – I can always adjust the recipe based on guests tastes. Max Fish Brunch starts this weekend (Sunday from 11-3), and we had Scot Haney come in a visit with Dave Bouchard and see what the Bloody Mary Bar is all about. 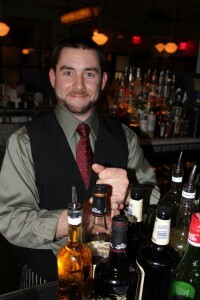 Check out the video and come on in for great, custom made Bloody Mary. 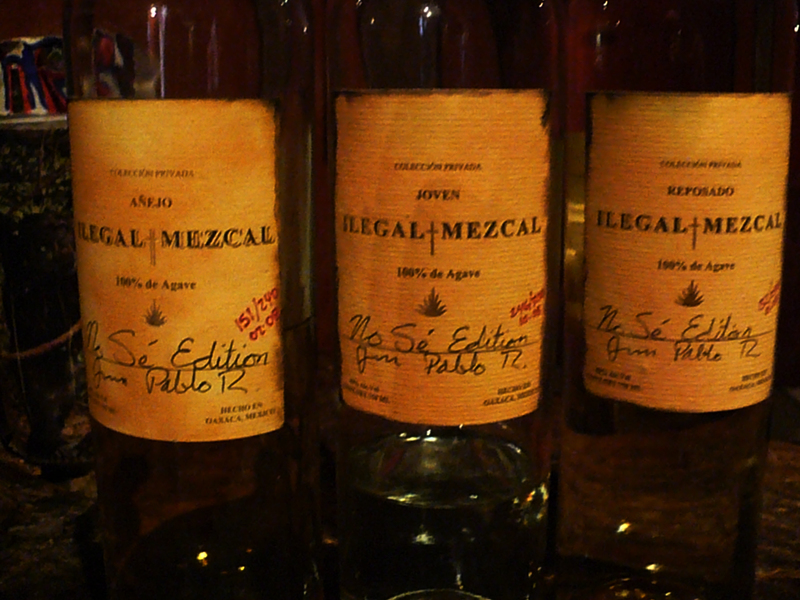 We tasted the Ilegal Mezcals this week and decided that these were must haves for our bar. The style of the mezcal is much different than its cousin Tequila as the agave is usually roasted in stone lined pits where the smoke from the charcoal is allowed to mingle and add to the flavor of the final beverage. Ilegal is a great brand and we will be offering the three styles (Blanco, Reposado and Anejo) either individually or in a flight of three. Check the atatched video for a great discussion and explanation on the Ilegal Mezcals. Tonight was another enticing evening at Max Downtow n with a great culinary adventure based around the wines of Bonny Doon Vineyard from California. Owner Randall Grahm has made a few appearances over the years at Max’s, and tonight added another chapter in this adventure as he discussed and amused guests with his fabulous wines and Max’s cuisine. 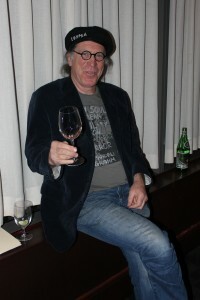 Randall is as lively as ever and we really enjoyed the wines, most focusing on Rhone varietals but with a few side-trips to Spain and other regions. Tasty food pairing wines all the way. Great stuff…Thanks Randall! A double batch of Bretwus Maximus was created this morning starting at 4am. We will have these in house in about three weeks – fresh as can be. The smell of the hops as they are going in the kettle is delightfully spicy, herbal and fruity all together, Mixed with the sweet, malty aromas of the grain – and you have beer heaven.